The name Cuachalalate comes from the name "Cuauchachalatli" which originates from the Nahuatl, Aztec Language and was later hispanalized to Cuachalalate. Cuachalalate was used during the Mexican Revolution by soldiers to treat their combat wounds, since its known that Cuachalalate has healing properties, it may not accelerate the healing process but it helps as the wounds are healing so there will be no ugly scaring afterward. Cuachalalate or Ampbypteryngium adstingens as is commonly known, is used to treat gastritis, gastrointestinal ailments such as ulcers, stomach cancer, and cutaneous wounds. It is also said that Cuachalalate is known for its cleansing properties as well as detoxifying effects within the circulatory system. The bark is the most utilized part of the plant. To cure ulcers, Cuachalalate should be soaked until the water gets colored, and then consume it. Depending on how bad your ulcers are, it might sting at first when you first began drinking the tea. In the case of acne wash the area with the water or drink it, for sores and light injuries place the powdered bark or resin on the affected area. In insect bites or blows, and as a skin healer wash the affected area for at least 5 days. 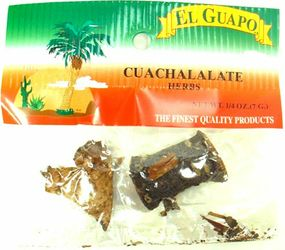 If the ovaries or uterus are infected, then boil the bark of cuachalalate to use as a poultice. Cuachalalate is used to treat circulatory problems, oral diseases, gastrointestinal diseases, urinary infections, wounds, pimples and skin diseases, Diseases of Women, Liver problems, lung and respiratory ailments. Consult your physician before using this product. El nombre Cuachalalate viene del nombre en Nahuatl "Cuauchachalatli" la lengua de los Aztecas y que despues fue hispanizada como Cuachalalate. Cuachalalate era usada durante la Revolucion Mexicana por los soldados para curar sus heridas ya que Cuachalalate si bien no acelera la cicatrizacion, ayuda a que la piel cicatrice bien y no queden feas marcas en la piel. Cuachalalate o Ampbypteryngium adstingens como tambien es conocida, es usada para tratar problemas gastrointestinales como ulceras, gastritis, cancer de estomago y heridas cutaneas. Se dice que Cuachalalate es conocido por sus propiedades limpiadoras, asi como sus efectos desintoxicantes atravez del sistema circulatorio. La corteza es la parte mas utilizada de la planta. Para curar ulceras, el Cuachalalate debe ser remojado hasta que el agua se pinte de color y luego tomarse. Si tus ulceras estan muy danadas y sensibles, puede que sientas ardor al principio cuando empiezas a tomar el Cuachalalate. El Cuachalalate sirve para tratar Problemas circulatorios, Enfermedades Bucales, Enfermedades gastrointestinales, Infecciones Urinarias, Heridas, granos y Enfermedades de la Piel, Enfermedades de la Mujer, Padecimientos hepatoviliares, Afecciones del pulmon y vias respiratorias y Otros padecimientos. Antes de usar consulte a su medico.